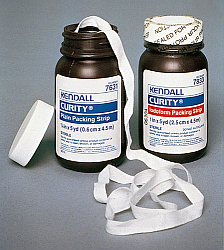 (Covidien) Fine mesh gauze makes these strips ideal for wet-to-dry wound packing. Made from 100% natural cotton. Choose from plain or iodoform strips. Sterile. Each strip is 5-yd. length. 12 strips per case.